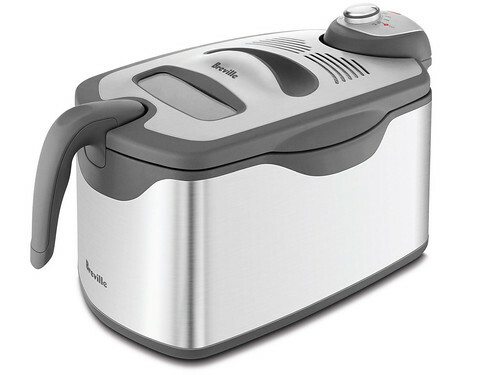 The Breville Deep Fryer with Cool Plate™ Technology BDF600XL – From quick snacks to classic meals, the Deep Fryer heats oil and with the Coll Plate™ technology, allows you to use up to 1/4 less oil the conventional fryers. 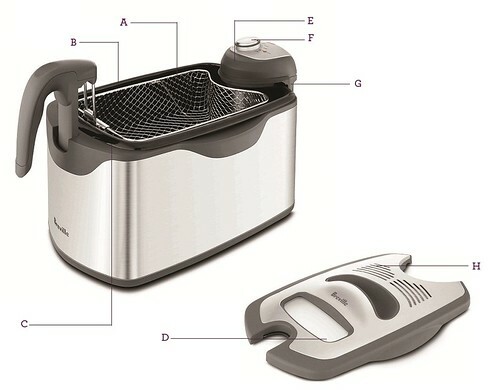 Jazz up any food easily and with the Deep Fryers gentle heating, you can reuse oil many times over. A. 2.2 lb. Frying Basket. B. Enamel Oil Vessel. C. 'Load' or 'Drain' Basket Lock. D. Lid with Viewing Window. E. 1800 Watt Element. F. Variable Temperature Control. G. Auto Shut-Off Protection. H. Permanent Mesh Filter.